Back in the day before major junior hockey expanded down east, Maritimers could choose whether to play in the Ontario or Quebec leagues. MacKenzie Weegar's progress with the Halifax Mooseheads makes one wonder if it would have been ideal if there was a similar option that reversed the flow, so players lost in the hockey shuffle in Canada's most populous province might not have to wait to be waived through the OHL before playing in a league where their skills might be a better fit. In any event, Weegar, a Barrhaven, Ont., native who was passed over in two OHL priority selection drafts before finding a home with the stacked Mooseheads, is adding to the roll call of Ontarians who have contributed to the often underappreciated quality of the Q. 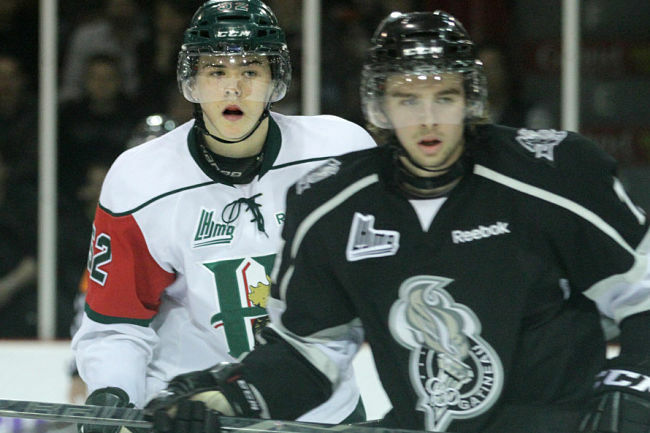 The 19-year-old led Halifax's defence corps in regular-season scoring as a rookie. The first cousin of former NHL defenceman Craig Riven has also taken on shutdown duties in the playoffs, making a case that he might be worth taking a flier on in the 2013 NHL draft. Philadelphia Flyers star Claude Giroux, a Hearst, Ont., native who starred for the Gatineau Olympiques, is the beacon for Ontario-to-QMJHL success stories. There are others, former Saint John Sea Dogs star Mike Hoffman, a Kitchener native once released out of the OHL, has gone on to see NHL action in the past two seasons with the Ottawa Senators. "To be honest, I don't know how the other guys were when they were younger but I was definitely a late bloomer who may have been overlooked," says Weegar, who chose the Mooseheads over playing in his hometown with the Junior A Nepean Raiders and pursing a NCAA scholarship. "I guess it was destiny to end up here. "I wasn't as fit as the other guys and my feet weren't as good," the 19-year-old adds. "But I great coaching back in Nepean and a great team to play on," says Weegar, who helped Nepean win the Central Canada Hockey League championship last spring. "I made the right decision, look at where I have got to now with all the players on this team and the success we're having." It's a reminder of how it's all about the endpoint, not the start. Weegar, whose path as a 16- and 17-year-old also included a Junior B stint before blossoming with the Central Canada league's Raiders, has adjusted well to Halifax. Earning power-play time on such a team with talents such as top draft prospects Jonathan Drouin and Nathan MacKinnon and a seasoned core of scorers surely speaks to Weegar's on-ice sense. "He had a great season," Mooseheads coach Dominique Ducharme says. "There were little details in his game. He had the Junior A habits a little bit where he would sometimes take too much time with the puck or his execution or reaction would be a little bit slow. He really adapted well. It took a little bit of time. He really improved on everything else — his skating, his positioning. "He's a great addition to our team," Ducharme adds. "having Weegar and [18-year-old right wing Max] Lindsay come in from Ontario has added a lot to our team." As Weegar notes, it took time for his conditioning and footwork to catch up to his hockey brain — and to enable him to bust his tail to get back after one of his sorties into the attacking zone. For that, he's grateful to several of his coaches in the national capital region — Raiders bench boss Peter Goulet; retired pro Mike Dagenais, who was his defence coach in minor midget; and Nepean assistant coach Taurean (Toe) White, who also Weegar's off-season trainer. Weegar also wears No. 52 as a tribute to his cousin Craig Rivet, who played 923 games across 17 NHL seasons. "He's definitely been a role model for my success growing up," Weegar says. "Just going up to North Bay in the summer and skating with him. We actually play a different game. He's more of a defensive defenceman and I'm more of an offensive defenceman. It's ironic how that worked out. But that's my game and that's what got me here. "You can't complain about having that close a connection," Weegar adds. "You're able to take in the work ethic he has and know what it takes." The Mooseheads' last stop on their championship quest offered Weegar a perfect reminder of the path he could have taken. On Wednesday, while he helped Halifax advance to the third round by sweeping Gatineau, Nepean was winning Game 7 of its league semifinal series just a few miles away. There's not much worth in revisiting that choice at this point. "I got to keep playing my game and jumping into rushes and playing my style," he says.